It's time to stop No Gas Day. 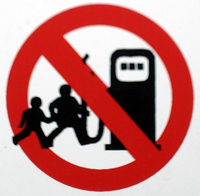 No Gas Day is a day when people boycott buying gas with the goal of lowering gas prices. While most people likely have good intentions when supporting this cause, they aren’t really accomplishing much. I found out about it through a Facebook event invite. I’m sure that many of the millions of people who said they are attending this event did so because it looks good, or because it makes them feel as if they are doing something. Other people were angry over high gas prices, confused or didn’t think it through. Trying to “start a revolution” can be a great thing, but revolutions simply don’t happen in one day. One could claim that Facebook is at fault for starting this false sense of activism, but traces of the idea can be found all the way back to 1999. Social media and technology makes it easier to spread ideas, however, it’s important to consider where information is coming from and if it makes sense. Read my post on CultureMob about why you shouldn’t participate in this event.